Total number of Olim from North America in 2017 is 3,633. Nefesh B’Nefesh, in cooperation with Keren Kayemeth Leyisrael, Israel’s Ministry of Aliyah & Integration, the Jewish Agency for Israel and JNF-USA assisted 196 individuals make Aliyah today. The group flight included 15 future lone soldiers, a soon-to-be bride and 37 individuals moving to Israel’s North, South and Jerusalem. Today’s new citizens bring the total number of North American Olim in 2017 to 3,633. 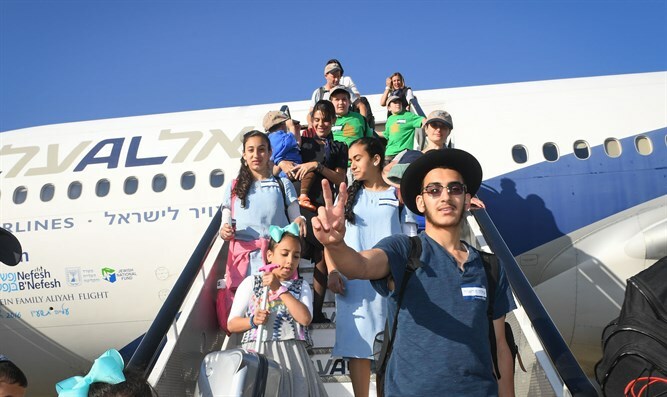 During this past year, Nefesh B’Nefesh facilitated 19 special Aliyah flights from North America, bringing 377 families with 677 children, and an additional 1677 singles. These Olim ranged in age from five weeks to 102 years old, mostly from New York, California, New Jersey, Florida, Maryland, Illinois, Massachusetts and Pennsylvania, as well as from Quebec and Ontario, Canada. Nefesh B’Nefesh’s employment and government advocacy departments continued to assist medical professionals by streamlining the licensing process making it easier for 61 doctors and 16 psychologists from North America and the U.K. to continue their professions in Israel, while contributing to the Israeli health-care system. Other leading professions included education, marketing, finance, high-tech, and lawyers. Amongst the top cities to welcome Olim in 2017 were Jerusalem, Tel Aviv, Ra’anana, and Netanya. The recently launched Nefesh B’Nefesh–KKL “Go Beyond” initiative successfully facilitated the Aliyah of hundreds of Olim to Israel’s northern and southern frontiers including Haifa, Tzfat, Zichron Yaakov, Karmiel, Tiberias, Nahariya, Hadera, Yokneam Illit, Pardes Hanna and Maalot in the North and Be’er Sheva, Ashkelon, Eilat, Ofakim, Mitzpe Ramon, Yerucham, Sderot, Arad and Meitar in the South.